It’s a little big ‘It’s A Knockout’, A little bit ‘Spitting Image’ – and 100% good fun! It’s a certainly an odd concept for a game show, but Jason Manford’s new Sunday night programme Big Heads has been a real hit! The photos from the hour-long light entertainment extravaganza are eye-catching, to say the least. It’s a pretty straightforward show: members of the public go head-to-head in a series of It’s A Knockout style physical challenges. The only catch is that they have to do it while wearing – you guessed it – big heads that disguise them as well-known public figures. 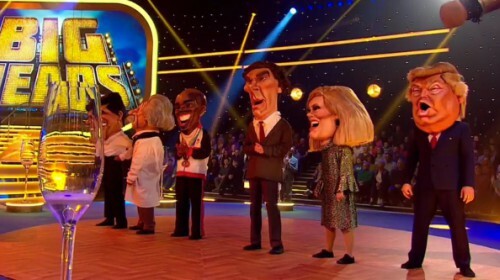 Among the roll-called of ‘Big Heads’, you’ll find the likes of Simon Cowell, Mo Farah, Donald Trump, Adele, Benedict Cumberbatch, Russell Brand and even Elvis Presley. If you look back with fondness on the light entertainment glory days of Gladiators or Total Wipeout, this could be the show for you, as it’s sort of a modern-day update of those family friendly game shows. Only, erm, a bit more surreal. Basically, if you’ve ever longed to see a nightie-wearing Donald Trump chased by a giant foam shark, your televisual dreams have been answered. Check out this clip of Simon Cowell running against a conveyor belt to try and get into a nightclub…. Big Heads airs on ITV at 7pm on Sunday nights, and life will never be the same again.